Below is a list of all 2013 SUVs, minivans and crossovers that seat 7 or more passengers. There are 45 different 7 passenger vehicles in total, so we summarized the most important details to help you compare them. Below the table you can find which vehicles were awarded the #1 spot in each of the following categories: Overall, Fuel Efficiency, “for the Money”, Minivan and Luxury. Unchanged from the 2012 model, the 2013 MDX kicks off the top five list with luxury and style. While not the lowest cost sport utility vehicle in this list, it is very competitively priced for the amount of luxury provided in even the base package. Featuring a single trim level with various options packages available, three rows and seven seats comes standard with the MDX. This should be considered when looking at the base price, since the third row comes at a cost in other models. 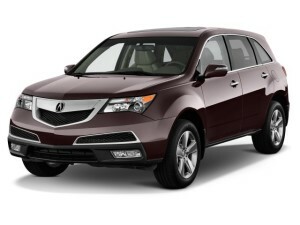 The MDX comes with a 3.7 liter V6 good for 300 horsepower and 270 pound-feet of torque. This is the only power plant offered and provides zero to 60 acceleration performance of 7.1 seconds. Fuel economy comes in at 16 mpg city, 21 mpg highway and 18 mpg combined. Standard trim includes heated eight-way power front seats, leather upholstery, three zone climate control, an eight speaker surround sound system including satellite radio and an auxiliary audio input jack, 18-inch wheels, a sunroof, fog lamps, and a power lift gate. 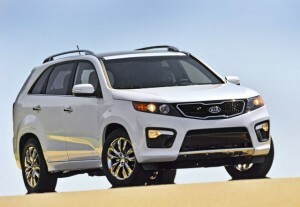 The Sorento enters 2013 mostly unchanged from the 2012 model and is a very well thought out car offering a wide range of packages and options availability. The base model is very nicely equipped, especially considering its starting price of just over $24,000. Engine choices range from one of two four cylinder motors putting out 175 and 191 horsepower, or a 276 horsepower V6. Gas mileage ranges from a low of 20 mpg combined for the V6 with all-wheel drive, to a high of 34 mpg combined with front wheel drive in the middle entry four cylinder engine. This car based crossover provides above average handling and while not the fastest of the group, has ample power for everyday driving to and from school and work. The interior can be customized with leather upholstery and an interactive voice activated electronics control system along with many other options. 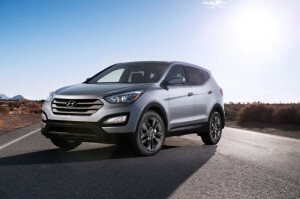 Hyundai redesigned the Santa Fe for 2013 and it is available in two models, a compact five passenger sporty model and the large 3 row model with seating capacity for seven. Those looking for seven seats will want to skip the sport model and start shopping with the Santa Fe GLS. Both three row models, the GLS and Limited, come standard with a 3.3 liter V6 that produces 290 horsepower and gets a very respectable 23 mpg combined efficiency for front wheel drive models and 21 mpg for all–wheel drive. Acceleration with the V6 comes in at 7.7 seconds for zero to 60 which is average to good for this category. Hyundai has been working for years to increase the luxury appeal of their vehicles. The Santa Fe showcases these efforts and holds up in comparison to the pricier MDX with a long list of standard features. The new exterior design has an attractive, modern style that holds its place next to more expensive models with grace. There is a reason used car lots are stocked with plenty of Hondas – they simply make some of the best cars on the market and they last forever. 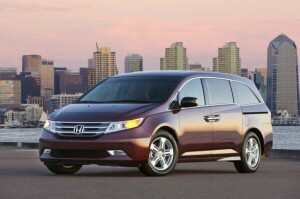 The 2013 Honda Odyssey has everything going for it allowing its entry into this top five list as the only van. With room to carry eight adults and 148 cubic feet of cargo space, the Odyssey stands out above the competition. The second row seat has room to fit an additional car seat for a total of three across in contrast to two captain seats available in competing models. 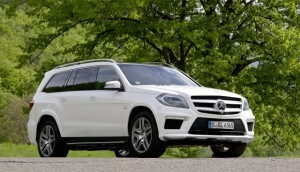 Starting at over $63,000, the Mercedes-Benz GL class was fully redesigned this year and is the best luxury SUV. If you can afford the GL, you’ll love its performance and high-tech features. Its handling is smooth and flat around corners and is considerably more nimble that most other Large SUVs. In addition, the GL’s standard diesel engine offers surprisingly respectable fuel efficiency at 17/21 mpg city/highway. For those that want a powerful seven seat vehicle, the Mercedes offers the highest power engine options available. In addition to the 240 horsepower V6 diesel, two V8 options are available producing 362 horsepower in the GL 450, and 429 horsepower in the GLS 550. The 550 does zero to 60 in a blistering 5.5 seconds. No hybrid powertrain is offered, but the diesel will serve those looking for good fuel economy well. In the event the GLS 550 just does not provide enough power to haul your load, there is a first ever AMG version offered with the GL 63. This model cranks out 550 horsepower that drops the zero to 60 performance to 4.8 seconds. The standard trim for the GL includes many features that are available as options on the other vehicles in this list. The interior is beautifully crafted with high quality materials and the cabin is very quiet. Features include power folding second row seats that make it easy to access the third row, rain sensing windshield wipers and heated front seats. See the top 5 vehicles of 2012.